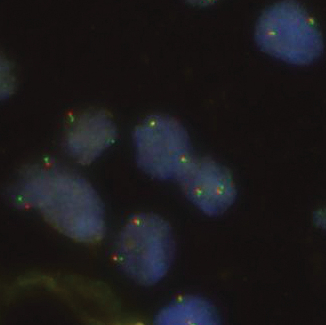 Oxford Gene Technology (OGT) has launched two new CE-IVD labelled fluorescence in situ hybridisation (FISH) probes, further expanding its extensive lung cancer portfolio. The Cytocell Aquarius® ROS1 Plus Breakapart and RET Breakapart probes* specifically and accurately detect rearrangements in the genome associated with the most common form of lung cancer — non-small cell lung cancer (NSCLC). The new additions complement OGT’s existing NSCLC probe range (including ALK Breakapart, EGFR Amplification and EML Breakapart), providing a comprehensive solution for diagnosis and patient stratification. Lung cancer is the most commonly diagnosed cancer as well as the leading cause of cancer death in males. The probes are available in two economical sizes and are premixed in hybridisation buffer — saving time and minimising potential errors. Fully optimised for use on formalin-fixed, paraffin-embedded (FFPE) samples, Cytocell FISH probes deliver high-intensity signals with minimal background for accurate, reliable results and confident diagnoses.